The CoffeeShop Blog: CoffeeShop 5x7 Baby Announcement Set 1! I wanted to let you know that I have a Back-to-School sale going on for blog/website designs. If you order a website or blog design from me this month, you will receive the CoffeeShop Action/Preset Pack (which includes all of my favorite actions, Lightroom presets, and my $25 watermarking action kit) as a gift! (Value $39). No coupon code needed but this deal is only available for a limited time. Yesterday I had a hankering to design a few baby announcements. I don't do a lot of custom card design, but I had so much fun designing this set and I plan to start posting more of them. Simply add your baby photo to the card using the clipping mask, change the font/text, and then either display them as digital storyboards or have them printed as a 5x7 card. 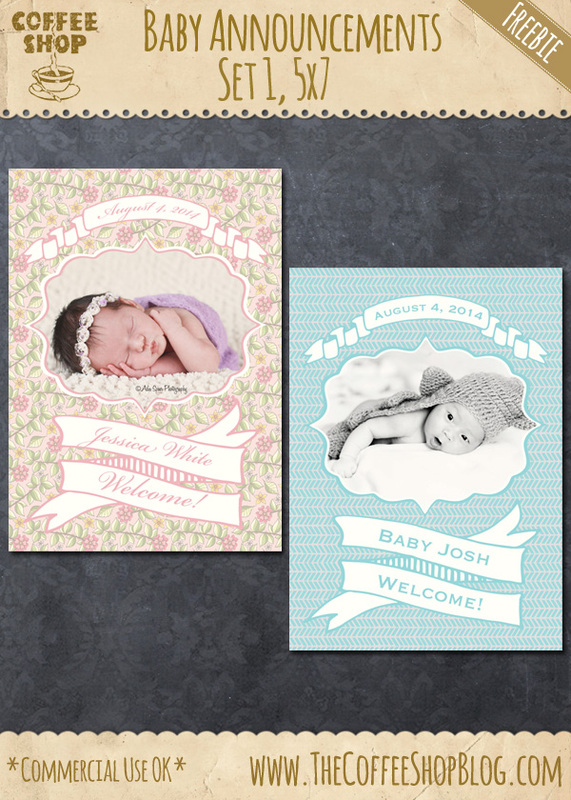 Download the CoffeeShop Baby Announcement Set 1. You can also download it here. I love these, but I thought it would be totally layered, so we could change the background image :(. Could you do some with all layers, so we can change the background paper? Thanks! Thank you Cathy! Unfortunately I used some designs in this set that have to be merged if I want to post them. I will create additional sets that are more layered using my own designs in the future.